To help students become more knowledgeable about the laws affecting those 18 and older, The Law Related Education Committee of The Florida Bar has a new approach to educate Florida’s high school seniors about their legal rights and responsibilities. 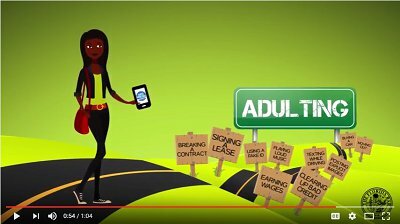 Through The Florida Bar’s dynamic Just Adulting mobile app, Florida’s high school seniors can be better prepared to “adult” in this exciting world of rights, responsibilities, and obligations. 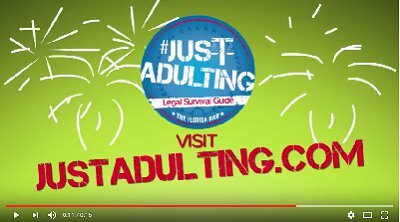 The app, which can be downloaded at www.justadulting.com, covers a variety of legal topics such as signing contracts, how to attain credit, the court system, alcohol laws, employment, texting while driving and many more. If you wish to have a volunteer attorney discuss the principles included in the guide with your seniors, please contact your school’s Justice Teaching volunteer. If your school has not been assigned a Justice Teaching volunteer, or if you are not certain who your volunteer is, you may contact the Justice Teaching Program at (850) 922-8926, or online at www.justiceteaching.org. These promotional videos are available for posting on school websites and all social media. Infographic – A colorful flyer that includes key facts about the Legal Guide website and app. Help distribute the infographic to high school seniors as soon as possible and print it out for visual placement as a poster around your school campus.